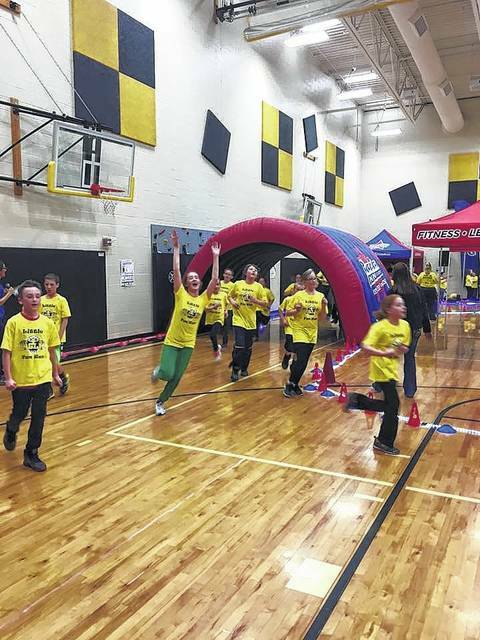 NORTH ROBINSON — On Friday, the gymnasium at Hannah Crawford Elementary School will be filled with teachers, students and excitement as the second annual Fun Run gets underway. The students have been garnering pledges and sponsors for each lap they run, up to 35 times around the gym. “Some people are giving a flat donation and some are pledging so much money per lap that the student runs,” said Colonel Crawford Elementary PTO (Parent-Teacher Organization) president, Tonya Hoepf. Hoepf said no other school in the area was organizing an event like the Fun Run. Hoepf said the event is hosted by Boosterthon. “They set everything up and help keep us organized. They are a great company to work with,” said Hoepf. Hoepf said proceeds from this year’s event will be combined with the money earned last year. “We have three options of playscapes to choose from for our elementary playground, which is the project we are currently working on,” said Hoepf. Hoepf said the event is fun for students and teachers alike. “The teachers have a great time right along with the kids. We also do challenges between classes for which ones raise the most money. We provide different awards such as pizza parties and pajama days,” said Hoepf. Hoepf said it is not too late for area residents to pledge money or sponsor a student or class. “People can actually pledge through the weekend before we tally up everything next week,” said Hoepf. For more information, contact Hoepf at 419-563-6059 or visit https://www.facebook.com/ColonelCrawfordElementaryPto on Facebook. Courtesy Photo Local residents and businesses can sponsor a Hannah Crawford Elementary student in the school’s “Fun Run” to help raise money for new playground equipment. http://aimmedianetwork.com/wp-content/uploads/sites/38/2017/03/web1_pledges.jpgCourtesy Photo Local residents and businesses can sponsor a Hannah Crawford Elementary student in the school’s “Fun Run” to help raise money for new playground equipment.